Killeen PD Needs Your Help Identifying this Person of Interest. 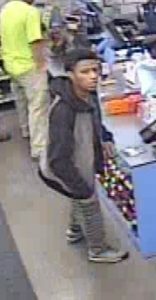 On November 17, 2017 at approximately 2:00 p.m., the victim reported to the Killeen Police Department that an unknown person burglarized his vehicle and stole two credit cards and made fraudulent charges in Killeen. Detectives with the Criminal Investigation Division, General Crimes Unit, are asking anyone who has information about this crime or the male in this photo, to contact Crime Stoppers at 254-526-TIPS (8477) or go online at www.bellcountycrimestoppers.com. You can also download the P3Tips App for IOS and Android and give an anonymous tip. All information given is anonymous and confidential, and if your tip leads to the arrest of the person responsible for this crime, you could be eligible for reward up to $1,000 in cash. Bell County Crime Stoppers is administered by a volunteer, civilian board of directors who work with a Killeen Police Department coordinator, the media, and the community to reduce crime and convict criminals. © Copyright 2019, Bell County Crime Stoppers. All Rights Reserved. Site by Presley Design Studio.